Published in 1984 by the SMILE Centre, this popular set of programs was used widely in many schools to supplement maths teaching. The programs were translated and enhanced by Pete Smith with the exceptions of GUESS, GUESSD, ELEPHANT, RHINO, SNOOKER and MASTER which are by Siobhan Leahy. The programming was funded by the Microelectronics Education Programme. This program was first written in 1979 for one of the first computers used in schools, the Research Machines 380Z, later becoming part of the MICRO-SMILE suite of programs used in schools to learn about angles. 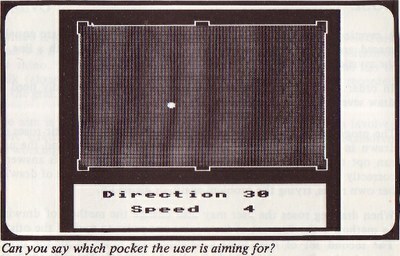 The first version of this software was developed by Richard Millwood as a Mathematics teacher at Scott Lidgett School in 1979. Its intent was to simulate a snooker ball, but when shown to school pupils it became clear that it engaged them in an inquiry to find the relationship between number and angle. Later, it was proposed to make it a resource for the Secondary Mathematics Individualised Learning Experiment project (SMILE). 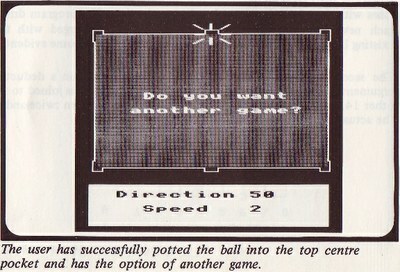 It is resource number 1624 and was developed further for the BBC Micro. 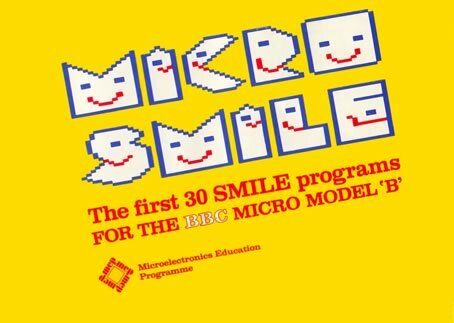 In 1984 the SMILE project published 'MICRO-SMILE - The First 30 SMILE programs' and Snooker became part of that package. Estimate the angle and pocket the ball! The outline of a snooker table is drawn with a ball somewhere on the table. The user is asked for the angle (zero is 'north' with the angles measured clock-wise as in a bearing) and then the speed (1 is slow, 10 is fast). The ball bounces around the table and if it does not fall into a pocket it slowly comes to a rest for another try. The program is highly motivating. Children without a full understanding of the measure of angles will enjoy playing and will ask for information. (There is always at least one pocket to aim for with an angle less than 90˚). Also, there is a feed-back for the child since it is immediately clear whether a particular angle was much too big or just too small. SMILE was an ILEA mathematics project which produced learning resources for children of all abilities in the 11-16 age range. Most of the many items were written by practising teachers and this included the design of the 30 computer programmes described in this booklet.